Daily Cheapskate: TODAY 12/2/18 ONLY: 10% off Target gift cards, up to $300! 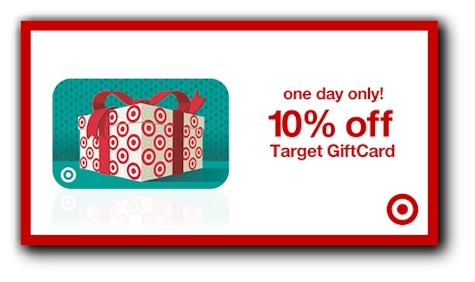 TODAY 12/2/18 ONLY: 10% off Target gift cards, up to $300! Today, Sunday, 12/2/18, get 10% off Target gift cards (maximum $300). These Target gift cards can be used starting Monday, 12/3/18. Quantities limited, no rainchecks, $300 in gift cards max per household. Why is this so awesome? It's just math. First of all, this beats the RedCard discount of 5%. Second, you are going to save 10% off anything and everything that you purchase at Target right out of the gate. That means that anything that you save after that (coupons, Cartwheel, bonus gift card offers, etc.) is just icing on top of the frosting on top of the cake. This is one of those no-brainer ways to save money with very little thought. Target has run this promotion for the past three years, and we max it out each year and go for the full $300, which I then turn into about 2 months worth of groceries. Please note, if you use your RedCard to purchase Target gift cards, you won't get an additional 5% off. Also, you can't use Target gift cards to purchase Target gift cards (at least not today).